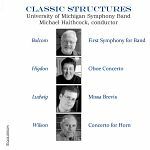 Pulitzer Prize composer William Bolcom is joined by 2010 Pulitzer Prize composer Jennifer Higdon, with composers Dana Wilson and David Ludwig in the first recordings of their works, presented by visionary conductor, Michael Haithcock and the University of Michigan Symphony Band. Oboist Nancy Ambrose King and hornist Adam Unsworth are featured in the Higdon and Wilson concertos respectively. 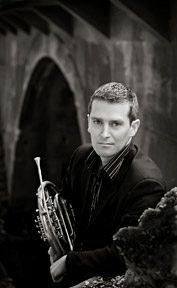 Before coming to Michigan, Adam Unsworth served as Fourth Horn of The Philadelphia Orchestra from 1998 to 2007. Prior to his appointment in Philadelphia, he spent three years as Second Horn of the Detroit Symphony Orchestra. He also served as a guest Principal horn with the St. Louis Symphony as well as Principal horn of the Colorado Music Festival. A former faculty member at Temple University, he has appeared at many universities throughout the United States as a recitalist and clinician. He has made several solo and chamber appearances at Carnegie’s Weill Recital Hall. Mr. Unsworth received his formal training at Northwestern University, where he studied with former Chicago Symphony Orchestra members Gail Williams and Norman Schweikert. He continued with graduate work at the University of Wisconsin-Madison with Douglas Hill. He later recorded Jazz Set for Solo Horn, released in 2001 as part of Thoughtful Wanderings, a compilation of Hill's works for horn. In 2000, the University of Wisconsin-Madison School of Music named him their Distinguished Alumnus of the Year. In 2006 Adam released his first jazz CD entitled Excerpt This!, which features five of his original compositions for jazz sextet and three unaccompanied works. 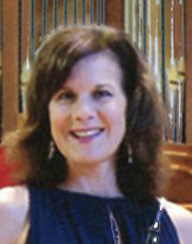 Nancy Ambrose King is an internationally recognized oboist, awarded first-prize of the Third New York International Competition for Solo Oboists, and with ten solo recordings released on a variety of labels. She has appeared as soloist globally, including performances with the St. Petersburg, Russia, Philharmonic, Janáček Philharmonic, Tokyo Chamber Orchestra, Prague Chamber Orchestra, Puerto Rico Symphony, Amarillo Symphony, and the New York String Orchestra. She has performed as recitalist in Weill Recital Hall and as soloist at Lincoln Center and Carnegie Hall, and was a member of the jury for the 2009 Barbirolli and 2016 Muri Oboe Competitions. She is author of Making Oboe Reeds from Start to Finish with Nancy Ambrose King, available on iTunes. Her playing has earned high praise from a variety of critics, including the American Record Guide: “Marvelously evocative, full of character, sultry and seductive, with a soft-spoken, utterly supple tone, and as musically descriptive as any I have heard…a fine exhibition of thoroughly musical oboe playing.” Currently Professor of Oboe at the University of Michigan and on the faculty of the Sarasota Music Festival, she is former President of IDRS (International Double Reed Society). A graduate of the University of Michigan, Ms. King was the recipient of the school’s prestigious Stanley Medal and was honored with its 2010 Hall of Fame Award. She received her DMA, MM, and Performer’s Certificate from the Eastman School of Music.